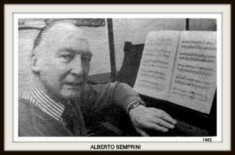 The internationally famous pianist and composer, Alberto Semprini, lived in Wivenhoe, in the house called Price’s House, in Bethany Street. Semprini was born in Bath of an Italian father and an English mother. His father was a musician and his mother an opera singer; their son Alberto obviously inherited this passion for music from them. He was sent to Milan to study piano, cello and musical composition. In 1928 he graduated at the age of 20 and had begun to win significant piano competitions. 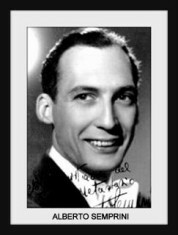 He joined BBC Radio in 1957 and hosted a popular programme called Semprini Serenade, which he introduced with the words: “Old ones, new ones, loved ones, neglected ones”. This programme ran for around 25 years. Alberto Semprini with his wife Consuela and family moved to Wivenhoe in 1979 from West Mersea where he had lived on a houseboat called L’Esperance during the 1960’s/70’s. People would pause by the boat to listen to him play – he also practised on a grand piano in a storeroom at Clifford White’s builders shop in Barfield Road, in West Mersea. He moved to Wivenhoe to make commuting easier to London to record his radio programme. He lived in the house called Price’s House in Bethany Street. He also had a house in Hamilton Road which is where he had his piano and practised there. Semprini at his piano. It is said he insisted on his piano travelling with him. He gave his last concert at the Mercury Theatre in April 1982. 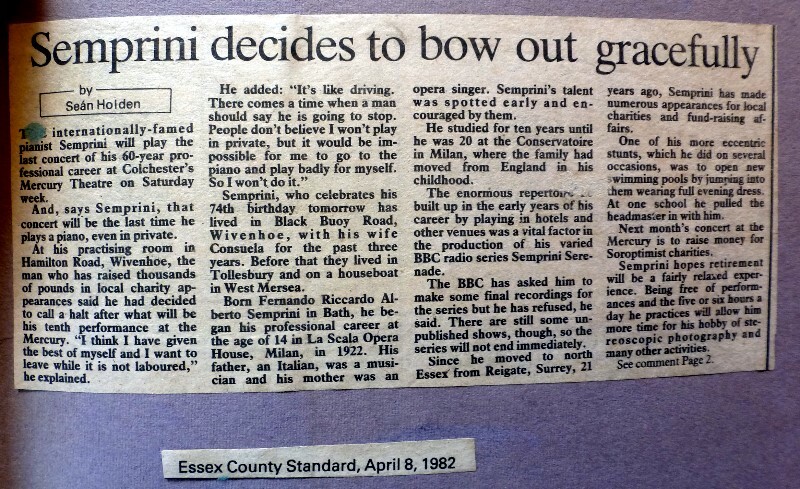 He told the Essex County Standard that he wanted to give up playing the piano as felt he had given the best of himself. He was aged 74 at the time of this concert. He even gave up playing privately, saying “it would be impossible to go the piano and play badly for myself, so I won’t do it”. Semprini raised thousands of pounds for charity over the years. This last concert at the Mercury was given to raise money for Soroptomist charities. He lived the last few years of his life in Brixham, in Devon. He died on 19th January, 1990, aged 81. In the 1980s, his son and daughter-in law, Chevi and Cheng Semprini, opened and ran the Talisman, a gift shop on the corner of High Street and Chapel Road. This page was added on 11/12/2016. In the early 2000s I used to commute to London with his daughter-in-law, but her name was Hayley. I had also understood from her that Semprini had lived in the house in Chapel Road. The building which Semprini used in Hamilton Road was the wooden building at the top of the road which was at one time a fish and chip shop owned by my Grandfather John Harvey Wix. It later became the St John Ambulance Hall and there is now a house on the plot. Hilary, thanks very much for this additional piece of information. So this wooden building was quite large then? Any pictures of it?